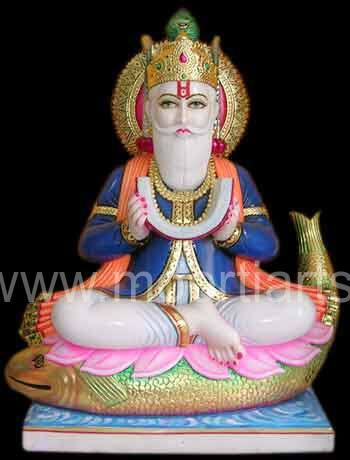 Faith has established Jhulelal as the Asht Dev (community God) of sindhis. His Birthday “Cheti Chand” second tithi of Chaitra auspicious for sindhis and is celebrated the world over with traditional pomp and gaiety. But how, when and where in history was the lord of sind born? Swayed by the promise, Mirkshah summoned the ‘panchs’ (representatives) of the Hindus and ordered them : “Embrace Islam or prepare to die”. The terrified Hindus begged Mirkshah for time to consider the ‘shahi firman’ or royal edict. The pompous Mirkshah relented and agreed to give the desperate Hindus forty days to plead with their God. Faced with imminent death, the Hindus turned to God Varuna, the God of the River, to come to their aid. For forty days, they underwent penance. 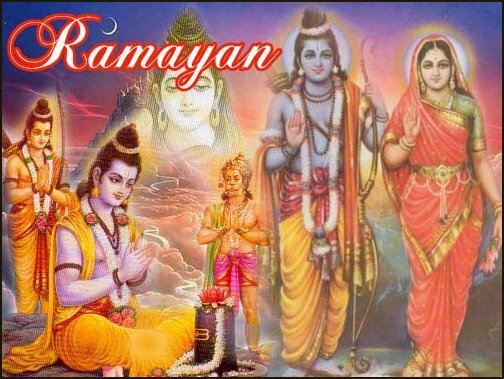 They neither shaved nor wore new clothes, praying and fasting and singing songs in the praise of God Varuna. They beseeched him to deliver them from the hands of their persecutor. On the fortieth day, a voice was heard from Heaven : “Fear not, I shall save you from the wicked Mirkshah. I shall come down as a mortal and take birth in the womb of Mata Devki in the house of Ratanchand Lohano of Nasarpur”. 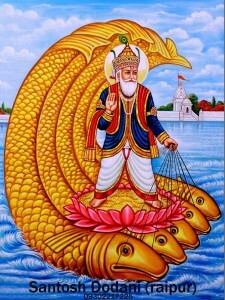 After forty days of chaliho, the followers of Jhulelal even today celebrate the occasion with festivity as Thanksgiving Day. The oppressed Hindus now anxiously awaited the birth of their deliverer. After three months, the second tithi of Asu month, they got confirmation of the news that Mata Devki has indeed conceived. The River God has incarnated himself in her womb. The Hindus rejoiced and praised the Lord. 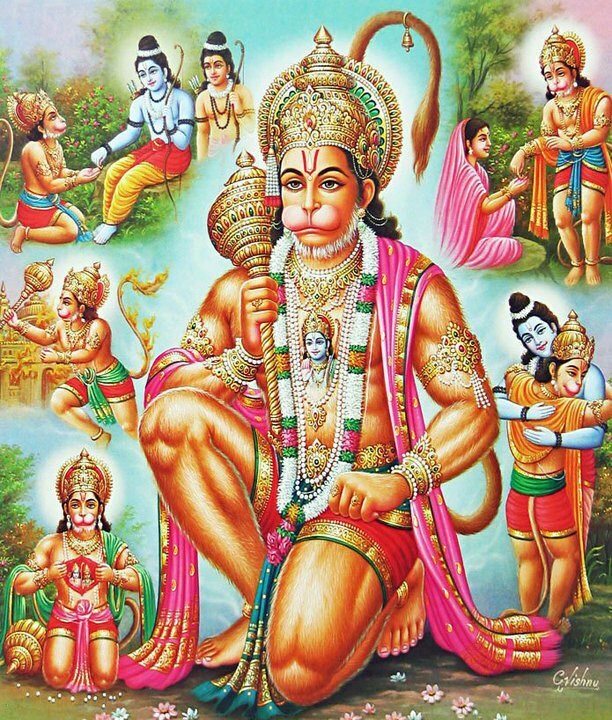 On Cheti Chand, two tithis from the new moon of Chaitra, Mata Devki gave birth to a boony boy, A miracle hailed the child’s birth. The babe opened his mouth and behold! there flowed the Sindhu with an old man sitting cross-legged on a pala fish. The pala fish as everyone knows is a tasty fish which always swims against the current. To welcome the newborn ‘avatar’, unseasonal clouds gathered and brought down torrential rains. The child was named ‘Udaichand’ (Uday in Sanskrit means moon-beams). Udaichand was to be the light in the darkness. An astrologer who saw the child predicted that he would grow up to be a great warrior and his fame would outlive the child. Udaichand was also called ‘Uderolal’ (Udero in Sanskrit means ‘one who has sprung from water’). Inhabitants of Nasarpur lovingly called the child ‘Amarlal’ (immortal) child. The cradle where little Udero rested began to sway to and fro on its own. It is because of this that ‘Uderolal’ became popularly known as ‘Jhulelal’ or the swinging child. Soon after the child’s birth Mata Devki passed away. A little later Ratanchand remarried. News of the birth of the mysterious child reached Mirkshah who once again summoned the Panchs and repeated his royal threat. Hindus, now quite confident that their saviour had arrived, implored him for some more time informing him that their saviours was none other than the Water God himself. Mirkshah scoffed at the very idea of a child saving the Hindus. “Neither am I going to die nor are you, people going to leave this land alive”, he jeered. “I shall wait. When your saviour embraces Islam, I am sure you will also follow suit.” With this remark, the haughty Mirkshah threw a challenhe to his Hindu subjects. The maulvis pressed Mirkshah hard not to let the Hindus of the hook. But the very thought of the child proving more than a match for him amused the conceited ruler. He therefore told the maulvis to wait and watch. As a token precaution, he asked one of his ministers Ahirio, to go to Nasarpur to see things first hand, Ahirio did not want to take any chances. So he took along a rose dipped in deadly poison. At the very first glimpse of the child, Ahirio was astonished. He had never seen a child so dazzling or more charming. He hesitated, then mustering courage proferred the rose to the child. The child gave a meaningful smile while accepting the rose. He then blew away the flower with a single breath. The flower fell at Ahirio’s feet. Ahirio watched stupefied as the babe changed into an old man with a long beard. All of a sudden the old man turned into a lad of sixteen. And then he saw Uderolal on horseback with a blazing sword in his hand. There were row upon row warriors behind him. A cold shiver ran down Ahirio’s spine and he bowed his head in reverence. “Have mercy on me Sindhu Lord”, he prayed “I am convinced”. On his return Ahirio narrated the miraculous happening to Mirkshah. But Mirkshah was not convinced. He hardened his heart even more. “How can a little baby turn into an old man ? ” he mocked. “It looks like you have been fooled by simple magic.” But in his heart, Mirkshah was afraid. That night he dreamt a dreadful dream. A child was sitting on his neck. The vision changed to an old man with a flowing beard. And again to a warrior with a drawn sword confronting Mirkshah on the battlefield. Next morning Mirkshah called for Ahirio and gave him orders to counter the threat posed by the child. Ahirio, however, advised Mirkshah not to rush matters. Meanwhile, the child Uderolal grew in stature and spirit performing miracles and comforting the sick. Residents of Nasarpur wre fully convinced that God had come to save them. Uderolal also received the ‘Gur Mantar of ‘Alakh Niranjan’ from Goraknath. To earn money for the family, Udero’s stepmother would send him to the market to sell baked beans, Instead of going to the market, Uderolal would go to the banks of the Sindhu. 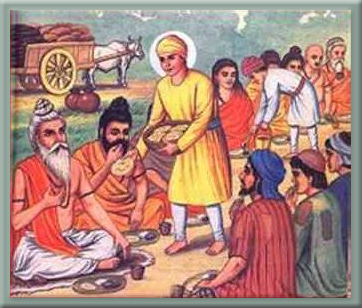 There he would distribute half of the beans among beggars, the poor and the sadhus. The other half, he would offer to the Sindhu. He would them spend the rest of the speaking to little children and the elderly about spiritual wealth. In the evening when it was time to go home, Udero would fish out from the river a container full of fine quality rice. This he would take home and give it to his step mother. Growing suspicious about her step son’s behaviour, the step mother one day despatched Ratanchand to follow him. 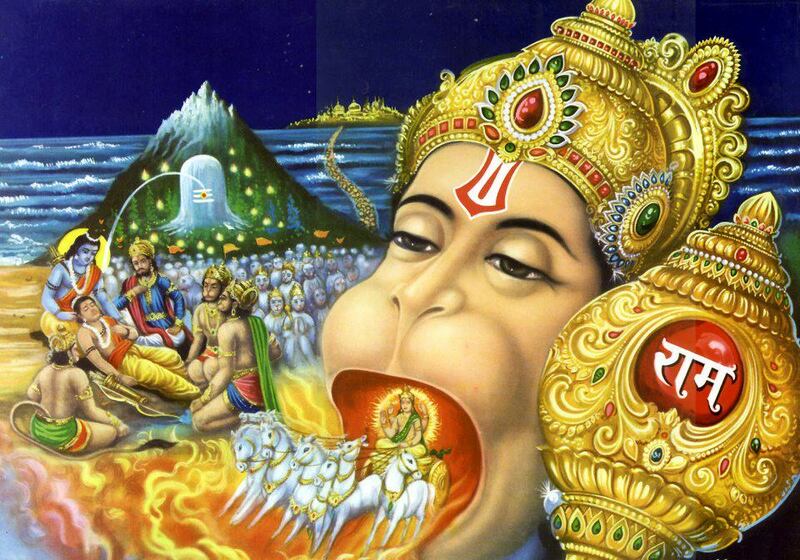 When Ratanchand witnessed the miracle, he bowed to Uderolal froma distance and accepted him as the Saviour. Mirkshah on the other hand was being pressurised by the Maulvis to bring Hindu infidels into the fold of Islam. They gave him the ultimatum. “Order the Hindus to convert or be branded as associate of kafirs.” Fearing the wrath of the clerics, Mirkshah decided to meet Uderolal face to face. He asked Ahirio to arrange for a private meeting with Udero. Ahirio who had in the meantime become a devotee of Daryashah, went to the banks of the Indus and pleaded with the Water God to come to his rescue. To Ahirio’s amazement, he saw the same old man with a white beard floating on a pala fish. Ahirio’s head bowed in adoration and he understood that Uderolal, the Water God, was in fact the other form of Khwaja Khirz. Ahirio then saw Udero leap onto a horse and gallop away with a sword in one hand and a flag in the other. Udero appeared before Mirkshah and explained to the stubborn ruler : “Whatever you see around you is the creation of only one God, whom you call ‘Allah’ and the Hindus call ‘Ishwar’.” The maulvis urged Mirkshah not to pay any heed to the infidels’s talks and to arrest him. Mirkshah dithering as usual ordered hos soldiers to arrest Udero. Mirkshah was terrified and begged Udero, “My Lord, I realise my foolhardiness. Please save me and my courtiers.” All at once the water receded and the fire died away. Mirkshah bowed respectfully and agreed to treat Hindus and Muslims alike. Before they dispersed, Uderolal told the Hindus to think of him as the embodiment of light and water. He also told them to build a temple in memory of transformation of Mirkshah. 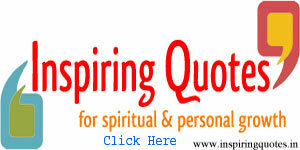 “Day in and out”, he said “light a candle in the temple and always keep available water for daat (holy sip)”. Uderolal named his cousin, Pagad, as the first Thakur (Priest of the religious sect that believes in Water God). Pagad followed Uderolal wherever he went. Uderolal gave seven sysmbolic things to Pagad. These seven from the essential elements of the Daryahi sect. 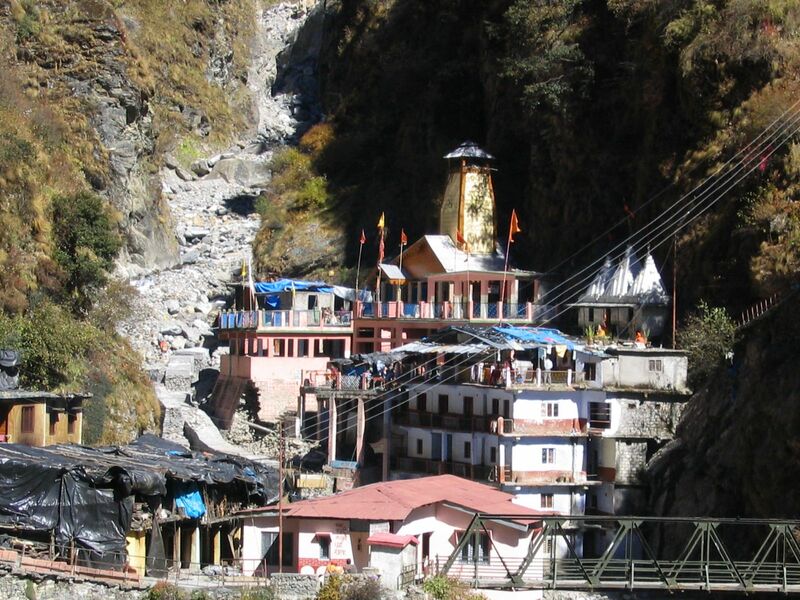 Uderolal asked Pagad to continue the sacred work of building temples and spread the message. Jhulelal continues to be the unifying force and the centre of all cultural activities of the Sindhi community. The word Sindhi is derived from the river Sindhu (now in Pakistan).” When Sindhi men venture out to sea their women pray to him for their safe return. They offer the Lord prasad of akha, a sweet made from rice, ghee, sugar and flour. 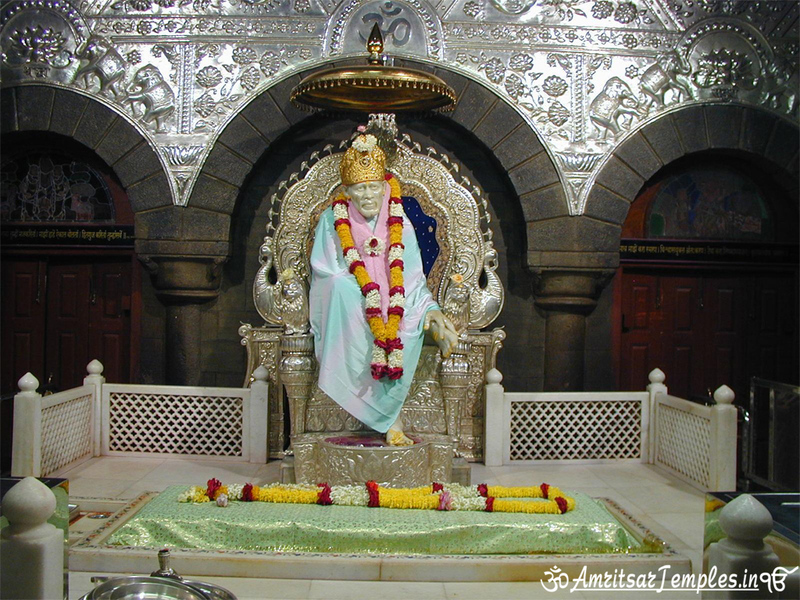 Sindhis all over the world greet each other with “Jhulelal Bera-Hee-Paar“.